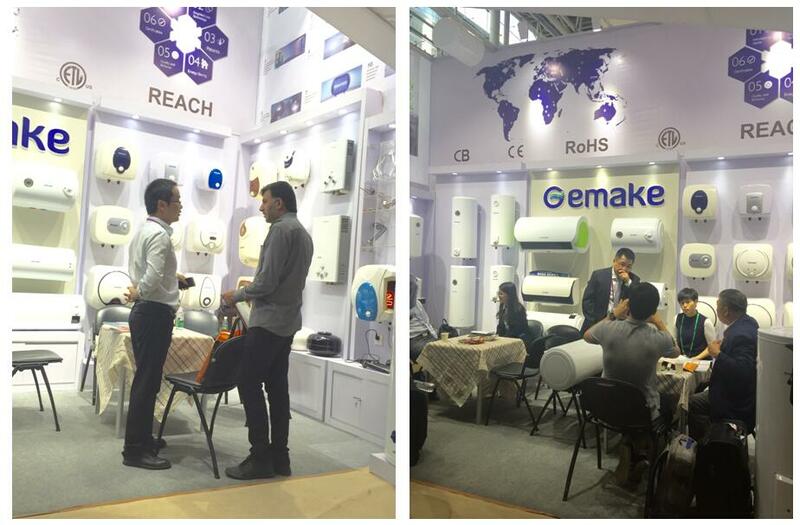 Guangdong Gemake Electric Appliance Co., Ltd, the professional water heater manufacturer,had taken part in 120th Canton Fair and obtained great effect.Thanks to the export policy and support from government.Gemake also witnesses the development of our country’s export business. According to the visitors data released by the authoritative department, 185,704 visitors from 213countries and districts came to the Canton Fair in this session, compared to 118thsession.The visitors quantityincreased 4.6%.Gemake also got goodresult at this session, approximately over 150 delegations and representatives came to our booth and checked our products, most of the visitors come from Middle East , Europe and Africa countries. Compared to last few years, North and South America clients increased not so much. Although many factories use lower prices to compete with competitors by lose basic profit. Gemake still stick to its ownmarketing strategy based on its own advantages, All in a word ,the long-term development of the enterprise mostly depend on its technology innovation and high quality products. Even you can get orders with lower price for one time, you still will lose your clients when quality of your products can not meet the requirements of the market,and it also will ruin the reputation of your brand. In the first phase of Canton Fair (from 15th,Oct to 19th,Oct 2016), Gemake display its newly designed model with WIFI control, music player (use blue tooth for easy connection).Modern and advanced technology makes it more popular among young generations. It is worth mentioning that single weld line of inner tank technology(with patent) attracts more new customers come to our booth. The Local Government also attaches great importance toGemake. Mr. Liu ,theDeputy-Director General of Commerce Bureau of zhongshan, Mr. Li , Director General ofDongfeng town , also visited Gemake booth ,and showed great interest in WIFI control model and operated it by themselves. Mr. Liu even said he really cannot wait to buy this model for his own use because of its fashionable design and special function. “Gemake water heater, Quality first”, we will keep it and we believe we can do better for next session.